Green Wraps. | Eat More Plants. Does your lunch look this beautiful? Always remember to eat the rainbow. 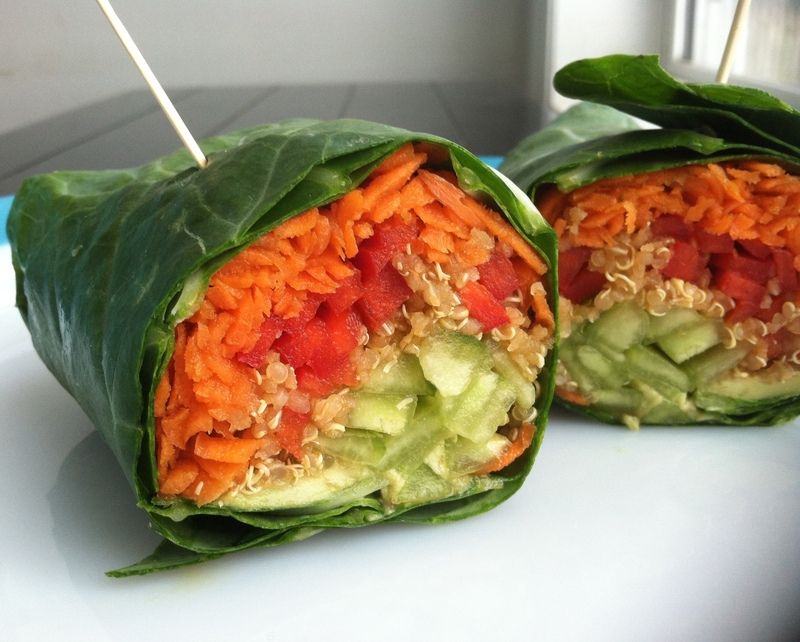 I used large collard green leaves to make a veggie & quinoa wrap for lunch. Cut the rib out of the leaf to make it easier to fold. Layer your filling starting at the root end of your leaf. You can lay two leaves down, overlapping, if one isn’t big enough. I layered red bell pepper strips, shredded carrots, sliced avocado, cucumber strips and quinoa mixed with tamari and lime. Roll tight and use a toothpick or two to hold it together. I’m making more fudge tonight. It is just SO good. I’ll try to make some with a filling in the center too! “Eat the rainbow” I love that! Vegan food is so much prettier than the yellows and browns of the omni world.